The Posse Chair sparks imagination and exploration. Posse’s playful saddle-like form and familiar material encourages a multitude of end uses, from sitting in social gatherings for tabletop activities to transforming into an expression of curiosity. Similar to a cardboard box, Posse is easily modified, decorated and drawn on, making it an open-ended platform for self-expression and therefore inspiring children to build their own adventures. 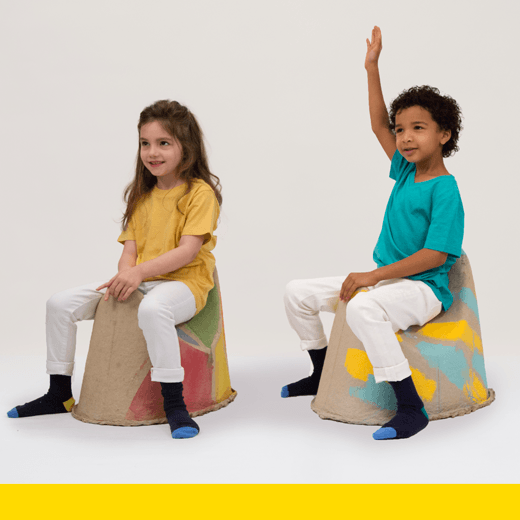 Posse is a durable seat made from molded paper pulp that is fully biodegradable, compostable and recyclable. The pulp undergoes a powerful vacuum-forming process to create an exceptionally dense structure that can hold over 200 pounds and has proven durability through real-world testing with children. It is also non-toxic, lightweight and soft, perfectly suited for children. Each Posse is economical to produce, making it attainable for many, and its ability to stack means it’s ideal for both smaller spaces and organized settings.